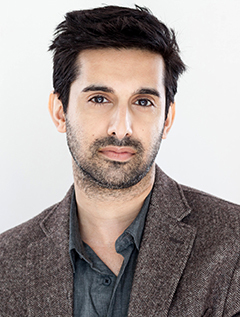 Vikas Adam is a classically trained actor with numerous credits in stage, film, commercials, and television, in addition to his over 200 audiobooks. He's established himself as one who creates versatile, distinct, and clear voices for characters he embodies. Equally at home with a light piece of literature or a dark thriller, a short story or an epic novel (his longest—forty-nine hours! ), Vikas's audiobooks have garnered numerous awards and nominations, including AudioFile Earphones Awards, various Best of the Year lists, and the Audie Award. When not recording, acting, or directing, he's a lecturer in the Theater Department at UCLA. He was an inaugural inductee into the Audible Narrator Hall of Fame.